Causes of Hives Rash: What are the Possible Reasons? Urticaria is the term used to identify the medical condition characterised by a sudden appearance of swollen, pale red bumps usually accompanied by an itchy rash on the skin. This condition is also described as an outbreak of hives. Medical reports show hives are commonly caused by allergic reactions to foods, drugs and other compounds. The likely foods that cause this allergic reaction in adults include shellfish, peanuts, tree nuts like walnut and almonds. These foods are usually identified as the trigger of hives after a careful investigation carried out by the physician treating the patient. Hives may also be aggravated by extreme temperature, water, strenuous exercise or stress. When a person’s body generate antibodies that irritate inflammatory cells, the resulted proteins production can lead to hives. According to the American Academy of Dermatology, an outbreak of hives also can be caused by insect bites, exposure to pollen, and allergy after shooting up. These inflammations could also be caused by the reaction of antibodies in our system which affects cells to cause a breakout of hives. A breakout of hives is usually not a life threatening event, but there have been cases where patients suffering from frequent breakout have later been discovered to have more complicated health issues. In these cases, the prevalent hives breakouts were simply symptoms of other illness, such as thyroid disease. Check out the excellent video below by Dr. Robert Overholt to learn more about causes of hives, and what’s your role in determining the root-cause of your hives breakout. Keep Breaking Out in Hives Daily at Night For No Reason? Some people have been dealing with hives almost on a daily basis for unclear reasons. Medical studies have failed to directly identify the general cause of hives, which means every case might tend to be different, while hives and itching often get worse at night because that’s when the body’s natural anti-itch chemicals are at their lowest. The suggestions given to people who experience a more severe breakout of hives at night randomly is to identify what might be causing it, since it happens mainly only at night. Did you have a bath or come in contact with hot water before going to bed? What did you eat for dinner or supper before you go to bed? Do you have your pets sleep on your bed with you? Studying these answers and thinking about your routine before bedtime should reveal some clues to identify the allergic trigger that cause your nighttime hives, so that you can take the appropriate actions to stop it subsequently. Experiencing a breakout at night can be very disturbing, as the itching will definitely interfere with your sleep and this can be frustrating. People who experience hives breakout at night with no known reason should seek medical assistance, not only because it is important to have a good night sleep, but Patients UK also reported that serious hives can cause breathing difficulties. The good news is that there are effective remedies that can be used to bring relief to hives breakout. The itching can be reduced by taking antihistamine – an over the counter prescription drug. There are also creams and ointments that can be applied on affected areas of the skin, they work by reducing the feeling in that part of the skin hence reducing the itching. One over the counter options to help get rid of hives fast is homeopathic remedy as a complementary or alternative medicine (CAM) for hives treatment. Homeopathy, a medical practice and alternative medicine based on the idea that the body has the ability to heal itself, was founded in 1796 by Samuel Hahnemann in Germany and has been widely practiced nowadays after gaining popularity over the years. 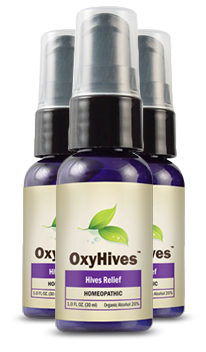 A leading OTC homeopathic hives relief product is Oxyhives. It contains all-natural ingredients like Apis Mellifera (honey bee) and Arnica Montana flower that have been used for decades as natural medication to cure hives. Oxyhives is a topical homeopathic solution that once it is applied to skin, the natural ingredients in Oxyhives will provide instant relief on intolerably hives symptoms by fighting against itchiness, swelling, redness, irritation, and pain. How Long Do Hives Breakout Last? While most hives outbreaks resolve on their own, the duration of such breakout varies as patients feedback show breaking out in hives can last for periods like a few minutes, a couple of hours or some days for more severe cases. As revealed by the American College of Allergy, Asthma & Immunology, there can be a breakout of hives on any part of the body. The features of each breakout may also be varied. Hives characteristically appear and disappear after a short while. The rash or bumps are usually reddish spotting clear edges. After the disappearance of hives, the area of the skin might remain pale for a while. Breakouts have been known to appear on parts of the skin usually covered by clothing, like the legs, upper arms etc. the breakouts are usually small patches at first but this can spread to cover larger areas of the skin. These patches usually look reddish in the middle and around the edges. Some tips on preventing hives include identifying suspected triggers in your lifestyle and stopping those activities or staying away from those substances or foods. While scratching the areas of your body affected by the rash too much can also leave sores, you can wear loose-fitting clothes to prevent further skin irritation. Your physician will also have some valuable advice that can help you prevent further breakouts. There are injections that can reduce your susceptibility to allergies; this is an option that can be used in cases of a severe breakout at night. Stop yourself from scratching the affected areas. Use creams and ointments for to get a relief from the itching. Stay in a cool environment to reduce the discomfort. Have an oatmeal bath with tepid water. Identify and avoid the triggers. People who suffer from the prevalent breakout of hives have to contend with a lot of frustration and emotional trauma. There are cases where severe breakouts can be potentially fatal, though this is very rare. A visit to a doctor is recommended, including to determine if you have chronic hives. Upon examination, drugs and ointments will be prescribed in line with the physician’s observations. The use of medication like Antihistamine drugs such as Benadryl and Zyrtec have been commonly recommended for treating hives. They work by reducing the action of the antibodies that trouble the cells causing hives. If you couldn’t figure out exactly what causes your hives breakout that only happen at night, then it is advised to conduct an investigation with simple questionnaires which should reveal some clues to identify the rootcause of your nighttime hives – for you to take the appropriate actions to stop it subsequently. The rash usually goes away, with the remedies like Oxyhives Spray are majorly used to provide you relief from the unbearable itchiness during an active breakout – especially for a better sleep at night time. ← Toothpaste and Salt on Cold Sores: Overnight Cure for Fever Blister?